We require deposits on all bookings, please enter the amount you have been requested to send to secure your booking. Please do this as soon as possible to secure the appointment. if no deposit is received 72 hours before, we will cancel you booking. A minimum of 48 hrs notice is required for appointment changes or deposit will be lost. 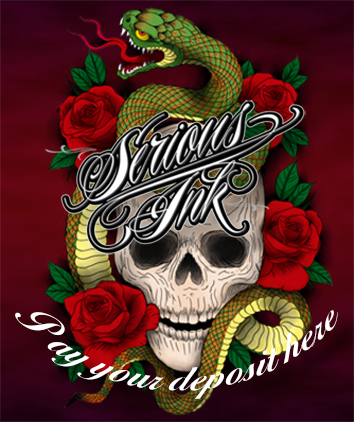 Moving, rescheduling or cancelling your appoint multiple times may result in the loss of the deposit, at the tattooist discretion. Changing the ideas / subject of your design or repeatedly requesting changes to the design may result in the loss of the deposit, at the tattooist discretion. Quotations are always a rough estimate and are subject to change if there are ANY changes (subject, size, colour, etc.) at the tattooist discretion. Not attending your appointment without any communication WIL result in an automatic loss of a deposit.